About a week or so ago, when E. said he had to spend a few days in Chennai, I hoped along, and after his meetings were over, we hired a driver and headed South to this little charming seashore town for the weekend. The name Pondicherry has always held a special aura, had a magical quality to it. As a French kid, I had always been fascinated by the place. La Route des Epices, or the Spice Route. Pondicherry used to be ours, it was a French colony. Now it’s not. I had a very specific reason for visiting Pondicherry, completely unrelated to the history of this country. A few months ago, thanks to a friend and Facebook, I discovered a watercolor artist whose work I fell in love with. His name is Rajkumar Sthabathy. Extraordinary. The gallery was our first stop after we checked into the hotel. We had trouble finding the place, and enrolled our driver and his Tamil language skills to call the owner for directions. I got out of the car, and was shocked and honored to see the painter himself welcome us upstairs. He’s a very unassuming man, rather shy. He seemed surprised that I knew so much about his work. We looked around at the painting on the wall, in awe. 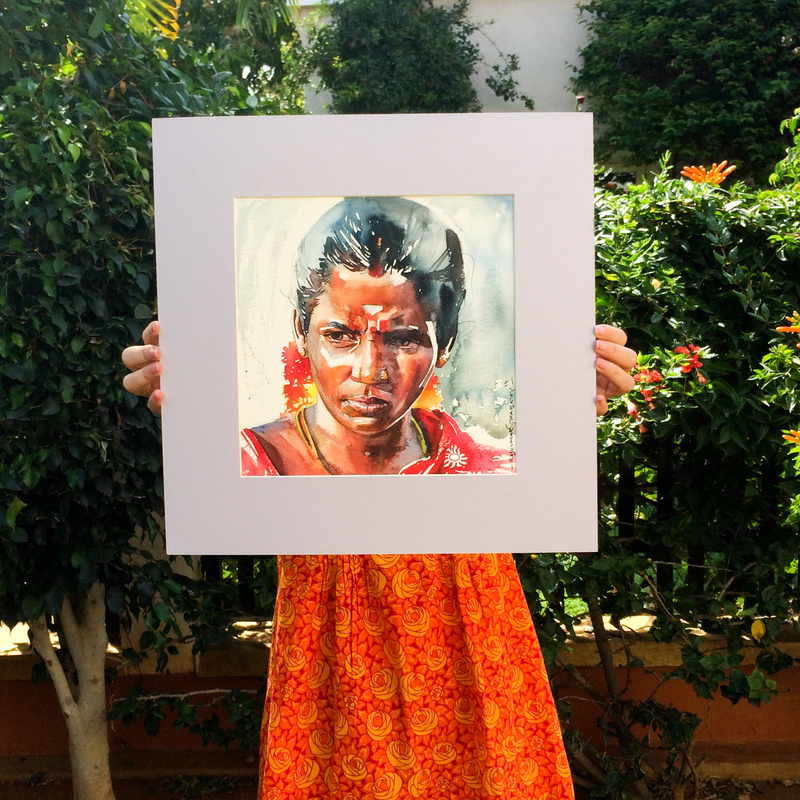 He then pulled out a few un-mounted canvases from a simple fabric bag laying on the floor. And there she was. The girl with the amazing face. The girl that embodies everything a village girl is to me. She’s actually a wife, as indicated by the red mark of sindoor powder at her hairline. Beautiful, proud, focused, dark, colorful. She’s now with me. We went back a couple of days later and bought another one. Bringing them back on the plane was quite a riot, but we managed. She is now safely in a corner of the house, waiting to be expertly framed and admired for years to come. Back to Pondicherry itself, a cute touristy little town. As in Louisiana, the French influence is still strong. Like in New Orleans, the town is divided between “White Town” (the French quarters in N.O.) located West of the canal, and “Black Town”, ie, the East part, the rest of the city. 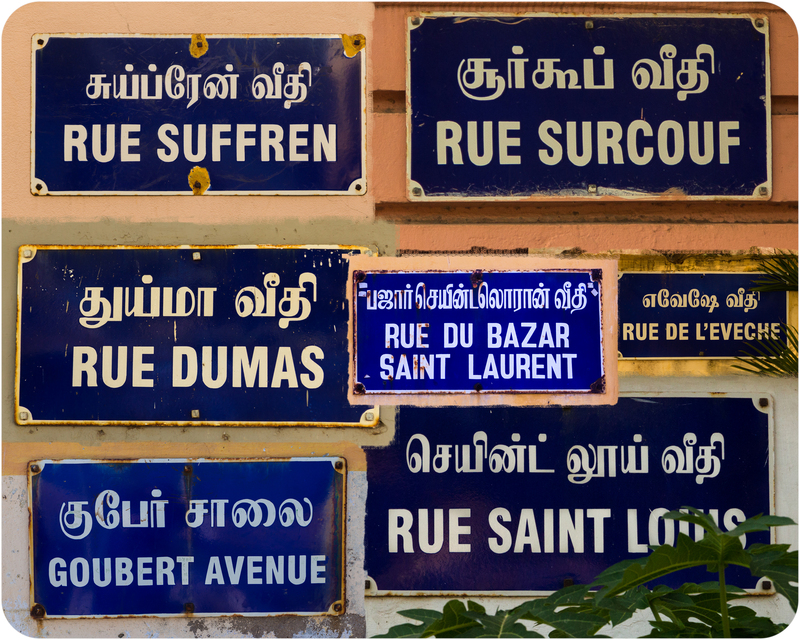 The street names are often “Rue de la Whatever”, using the same blue metal plaques as in the old country. It is not unusual to be greeted in French while entering a restaurant, or by people on the street. Aside from history, it may have also to do with the massive amount of French tourists. It truly is a lovely quaint little town, very photogenic. The streets seem wider, with barely any congestion. The house exteriors are often painted in bright colors, with more bougainvilleas and blooming trees than you can imagine. There are much fewer cars, but many two-wheelers and bicycles. We saw women in saris riding bicycles. All this made us long for the Bangalore that we never knew, that of 20 years ago, when it had bungalows instead of sky-scrapers and a population under a million. 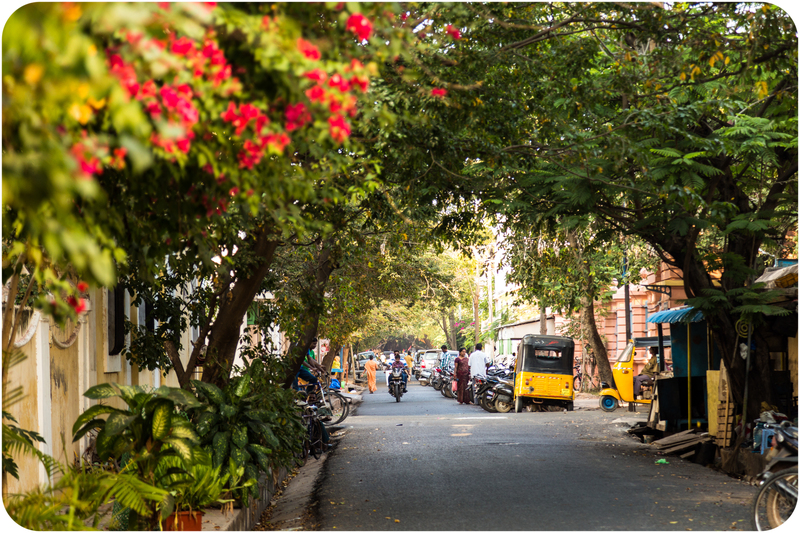 Pondicherry has, once again, made us want to buy property here, and enjoy a stress-free life. This happens every time we visit a seaside town, Goa, Kochi, even Chennai (Mumbai doesn’t make the list!). I call it the “Hotel Marigold syndrome”. But there is no such thing as a stress-free life in India! Pondicherry is a place where you can walk, take a stroll, which is quite a luxury in this country where walking is a mode of transportation and not a leisurely activity. You can breathe easily, without (noticeable) fumes, dust or pollution. I walked a lot in the French Quarters, and on the Promenade, the stretch of road along the Bay of Bengal, another magical name. At night, there are hundreds of people, families, single guys, as well as foreign tourists. We met many people who wanted their picture taken for no other reason that they saw me with a camera. Those three guys came to me, asked me to click a photo, shook my hand and ran away laughing. Even after 15 months, I still don’t get it, but I still enjoy it, every single time. The same happened at the gas/petrol station. We walked to the Grand Bazar, which is a really nasty smelling food market. We met some hungry kittens. We then walked at the Sunday market, where they sell everything under the sun. When we were done walking, we rented a scooter. With an engine, you go faster and further. We drove around aimlessly, went into some parts of town that were probably not too safe. We found a fisherman’s village while looking for a beach (which we didn’t find) and got dozens of people waving at us. The fact that I was possibly the only person in town on a two-wheeler wearing a helmet probably amused them. It’s easy to forget that India was violently hit by the tsunami in 2004 and Pondicherry saw many casualties and houses destroyed. One mural in the village still stands, though, since the colors are still vivid, it is more likely from the second lesser-known cyclone that hit in 2012 (while my buddy was on a business trip in Chennai!). The mural explains what government funds are available for those made homeless by the tsunami. We saw plenty of dogs, a bit skinner than Bangalore’s, fewer tuk-tuks but more goats. They have hundreds of goats in the streets. I do not know if they belong to someone or just roam free. I felt silly when I waved and took pictures of a group of people, then realized they were entering a cemetery. What we mistook as another religious happy festival turned out to be the goodbye celebration for a loved one. Talking about religion, we both got blessed by an elephant in front of a temple. The process is simple: you give the elephant either a 10-rupee bill, or a fruit. She quickly, yet precisely, takes it with her trunk, curls the tip of her trunk and hits you on the head! If you gave her money, she will then give it to her owner. If you give her a guava, she throws it in her mouth, peel and all. Since we need all the blessings we can get these days, I also visited the Catholic church by the sea, and all the descriptions of the Twelve Stations of the Cross were in French. As quaint as it is, this town has more garbage in the street than anywhere else I have been. The canal has blankets of floating crap, all going into the ocean. Poverty is more visible than in Bangalore but I feel the same way every time I go to Chennai, as there are more tent settlements on the sidewalk than back home. We visited Auroville, an experimental utopian village created in the late 1960’s for the betterment of mankind. Since I have nothing nice to say about it, I will keep quiet. But here’s a couple of pictures of the gold colored bubble standing in the middle. Aside | This entry was posted in Street photography, Tourism and tagged art gallery, Auroville, Bangalore, Chennai, expat, India, mural, painting, Pondicherry, Rajkumar Sthabathy, scooter, street photography, Tamil Nadu, tsunami, watercolor. Bookmark the permalink. I felt sad when I visited Pondicherry. I’d expected so much more – the streets were beautifully laid & the houses were quaint but the rubbish, especially that along the beautiful sea front promenade was disappointing. Most buildings were in dire need of refurbishment – I saw a town with a rich history but a ‘lost’ present. Interesting that you didn’t have anything positive to say about Auroville – I felt exactly the same! All seaside cities we have visited suffer from severe cases of fungal infection. We found a lot of activity in the fishermen’s village, as well as away from the touristy places, where “normal” life occurs.